LOS ANGELES - November 28 2018 – In another step to improve customer service and convenience, Metrolink today announced the launch of the Metrolink Ticket Web Portal at https://tickets.metrolinktrains.com/ where one-way tickets can be purchased and customers can print them at home. Metrolink’s online portal opens for business on Nov. 28. 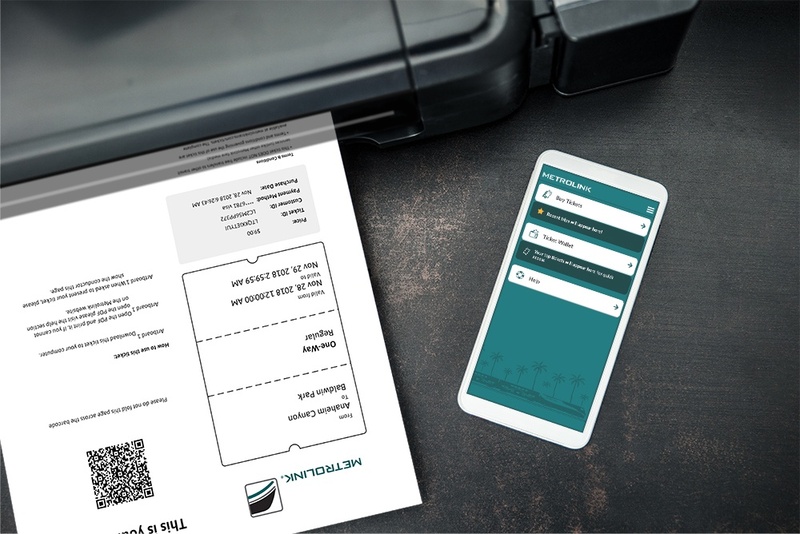 “Metrolink customers want to make their arrangement when it’s convenient for them and adding the online ticketing portal with the print at home option satisfies that demand,” said Metrolink Interim Co-CEO Ronnie Campbell. Tickets purchased at the Metrolink Ticket Web Portal contain a secure barcode that is scanned onboard by inspectors using the Justride Inspect Handheld app. The portal also allows the option of sending tickets to mobile devices, which is useful for customers who may have a smartphone. The online ticketing portal offers the purchase of one-way tickets only without transfers to Metro buses or rail or other transit providers. Transfers to other transit systems will require separate tickets. Metrolink’s online ticketing portal is compatible with Google Chrome, Mozilla Firefox, Safari or Microsoft Edge internet browsers. Masabi provides Software-as-a-Service (SaaS) ticketing and payments to public transport agencies of all sizes around the globe. Whether looking for a mobile ticketing system, want to enable Mobility as a Service (MaaS), or require an account-based full fare collection solution using a contactless bank card, mobile device or smartcard, Justride is the platform for you. Justride, unifies account-based and pre-pay ticketing into a single configurable solution. Its SaaS architecture, ‘Mobile First‘ approach and Bring Your Own Ticket (BYOT) philosophy, allows transit providers to deliver innovation quickly, delighting passengers and reducing costs, while increasing efficiency and data insights. Masabi is the category creator for transit mobile ticketing and with over 40 clients across 4 continents the Justride mobility platform is the most widely deployed end-to-end mobile and account-based ticketing solution in operation, serving the largest agency in the USA to the smallest bus operator. It has offices in New York, London and Cluj and investors include Mastercard and Keolis. Metrolink is Southern California's regional commuter rail service in its 25th year of operation. Metrolink is governed by The Southern California Regional Rail Authority (SCRRA), a joint powers authority made up of an 11-member board representing the transportation commissions of Los Angeles, Orange, Riverside, San Bernardino and Ventura counties. Metrolink operates seven routes through a six-county, 538 route-mile network. Metrolink’s passengers travel approximately 441 million miles each year, making Metrolink the second busiest public transportation provider in Southern California. Metrolink is the third largest commuter rail agency in the United States based on directional route miles and the eighth largest based on annual ridership.